Which Homeschool Mom Are You? Becky: Organizes all field trips and special events. Has a homeschool planner the size of your face. Created Gifted and Talented class for co-op. Children will graduate at 12. Reads microbiology texts for fun. Blanche: Into cloth diapers and unschooling. Has an awesome recipe for an all-natural floor cleaner. Will gladly share political interests and worldview, even if not asked. Prefers to let her children roam free during group events but has strict list of things they cannot eat. Vicky: Sarcastic and occasionally inappropriate. Raising independent learners who study classic rock and world cultures. Not into homemade or DIY, instead prefers buying treats on the way to co-op and finishing off the wine at Mom's Night Out. Rose: Will literally never be on time. Has a wallet stuffed full of receipts, ticket stubs, and every store loyalty card. Children are often mismatched or missing items. Flighty but very creative. Uses an eclectic mix of curriculum. Needs coffee to survive. Sharon: Lives in a subdivision you can't afford to walk by. Children look like tiny J. Crew models. Has a prominent Instagram following. School supplies are color coded and work is done in a white kitchen around a large farm-style table. Dorothy: Skirt wearing and soft speaking, she can be found reading her Bible. Believes chores are as fundamental as reading and math. Diligent and steadfast. Probably owns chickens, cans her own food, or sews her girls clothes. Carrie: Upbeat and positive. Constantly on her phone. Uses the term "mom boss" frequently and can be found working on her "side hustle" while the kids do their independent work. Refers to all women as "girl" and has a great opportunity for you! Amy: New homeschool mom of littles. Obsessed with choosing the right preschool curriculum - thinks it will affect their college choice and/or future career. Hums "Baby Shark" without realizing it. Surviving on hope and baby smiles. Elizabeth: Has been homeschooling awhile. Arrives to co-op with dark circles and a glazed expression. Barely keeping up with the required recommendations for her state. Burnt out doesn't begin to describe how she feels. Needs a sunny island vacation or maybe just a listening ear. Gertrude: Veteran homeschool mother of teens. No-nonsense but also super wise. Knows every curriculum choice and has tried most of them. Can be found calculating graduation credits and secretly planning what to turn the kids rooms into while simultaneously trying not to cry about them leaving. Well, did you think of someone you know? Which one sounds most like you? Obviously I've exaggerated and stereotyped but we all know someone like one of those examples or can relate to feeling like that. 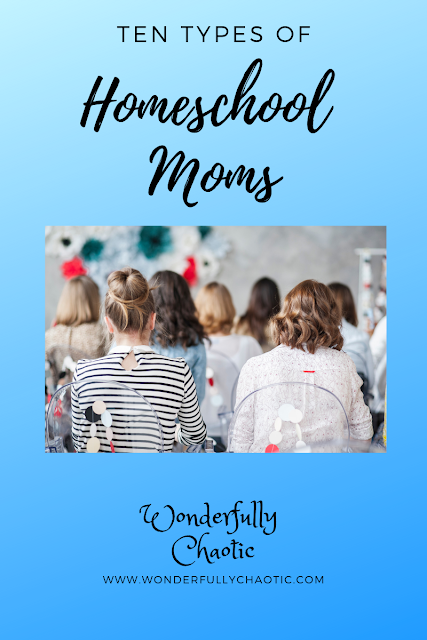 The beauty of homeschooling is that it can be different for each person. There's no *one* set way to homeschool your kids. As long as you're following the legal requirements and doing the best for them, you can be a little of Carrie and Vicky and Amy. Be your unique self and do what works for you and your family!